In the veterinary diagnostics industry, modern laboratories are opting for real-time qPCR-based (qPCR) tests instead of antibody testing because of the increased speed and accuracy of qPCR tests. The heightened specificity of qPCR tests enables scientists to detect and differentiate among closely related strains. Real-time PCR has overcome many obstacles that previously hindered its adoption in veterinary diagnostics laboratories. 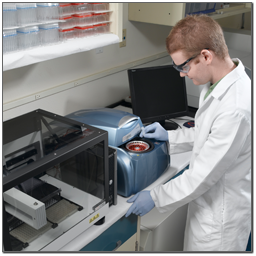 A combination of the latest state-of-the-art technology such as “fast” real-time PCR and sample prep automation dramatically reduces pathogen detection time, sample contamination, and user error. The use of qPCR testing allows veterinary diagnostic labs to identify affected animals quickly and take steps to treat or contain the illness. LGC Biosearch Technologies manufactures a variety of qPCR probe formats to suit your specific needs. Our Dual-Labeled BHQ® probes, Molecular Beacons, and Black Hole Scorpions® primers use a BHQ dye as a quencher, ensuring a clear signal and a reliable test. 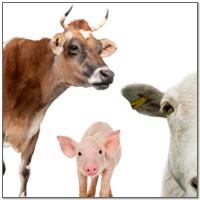 As the per-animal cost of SNP genotyping continues to drop, it is becoming economically viable to use SNP genotyping to select for desirable traits. The ability to examine the commercially important genetic markers in livestock opens up new possibilities for improving quality and decreasing production costs. Consequently, SNP genotyping for livestock is an attractive area for new research and new veterinary diagnostic products. BHQplus® probes are compact probes labeled with a BHQ dye as a quencher. These probes contain a novel duplex stabilizing technology allowing for shortened sequences with heightened specificity, making them ideal for probe based SNP genotyping. Veterinary diagnostics developers and manufacturers who need quality components for their real-time PCR assays outsource their oligonucleotide manufacturing to LGC Biosearch. This keeps variable costs under control and frees up time and resources for development. LGC Biosearch manufactures a variety of probe formats and offers a wide selection of dyes to suit your licensing requirements. Our proprietary robotics have the capacity to synthesize thousands of oligos rapidly and with precision to give developers what they need, when they need it. Additionally, LGC Biosearch’s expertise in oligo synthesis, assay design optimization, and customizable manufacturing processes are just a few features that make us a preferred option for veterinary diagnostics test developers. As part of our contract manufacturing services, LGC Biosearch offers veterinary diagnostics companies a comprehensive quality system with the ability to provide full traceability of produced oligos. We realize that every situation is different, so we offer different levels of documentation and customizable quality specifications to meet the requirements of your assay. If you have any questions on how LGC Biosearch can help you with the development of your veterinary diagnostics test, email info@biosearchtech.com or call us at 1.800.GENOME.1(436.6631) . We will be happy to answer any questions you may have.